The hydro facial tips unique spiral design and powerful hermetic suction provides unparalleled non-invasive skin resurfacing and temporary pore opening to effectively cleanse exfoliate and extracting impurities evenly without damaging the skin while simultaneously delivering proprietary serums into the skin. 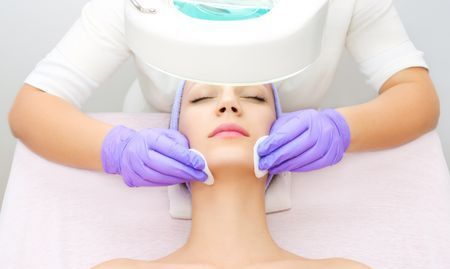 The first step in the hydrolift facial treatment gently cleanses the skin and effectively exfoliates the stratum corneum layer removing dead skin cells and sebum this allows the skin to reflect more light and adhere brighter and healthier. The second step uses a non irritating effective mix of Salicylic, glycolic and lactic, citric and tartaric acids to help loosen deep pore debris and dirt preventing the formation of the pustules involved in acne. The third step uses painless vortex extraction providing strong vacuum suction to automatically remove blackheads and other impurities. The fourth step in the Hydra facial procedure applies vortex fusion delivering a pro antioxidant hydrating formula with potent peptides and acids into the skin, this step provides hydration, rejuvenation and restoration for a healthy skin structure and function. Using the most advanced non ablative non laser skin rejuvenation system on the market today the Hydrolift with vortex technology thoroughly cares for your skin and provide effective long-lasting results with no downtime or discomfort. Lactic Acid: Lactic acid wash will strengthen and brighten the skin while helping to treat sun damage or hyperpigmentation, dehydrated skin, fine lines, acne-prone and rosacea-prone. Tartaric Acid: Used in some acne treatment products and peels because they help to unclog hair follicles blocked by dead skin cells, bacteria and sebum. They are also modestly effective for lightening dark skin pigmentation and for improving the appearance of acne scars.